Step-12 Now we are going to apply materials and textures to the vase and the floor. We will start with floor first. Select the floor in object-mode. 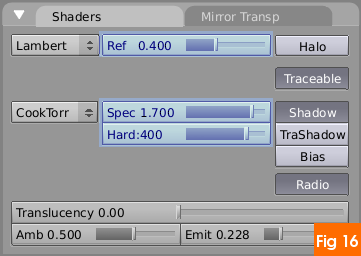 Press [F5] to bring up Shading & Materials features in the buttons-window. Press ‘Add-new’ button to assign a material to the floor. 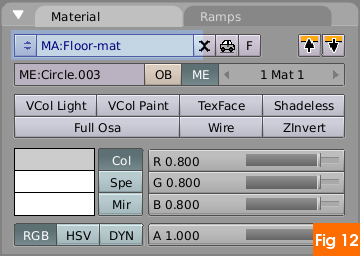 As soon as you assign a new material the ‘Add new’ button gives way to ‘material name entry-box’ click it and type ‘Floor-mat’ for easier identification. Step-13 After assigning a material you can now add textures to it. For floor we are going to add a wood image texture. Press [F6] , the Texture-buttons window opens. 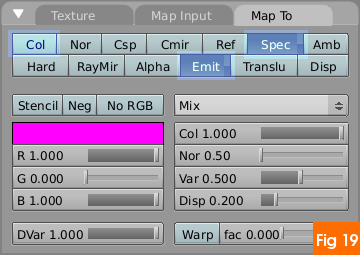 In ‘Texture’ tab click ‘Add new’ to add a texture channel. Immediately a ‘Texture-type’ drop down list appears from it select ‘Image’. Again a new tab called ‘Image’ tab appears next, click the ‘Load Image’ button and browse to the texture wood-tile.jpg, select it and press [Enter]. In Xrepeat: and Yrepeat: increase both values to 4. Step-14 After adding the wood image texture, we will now modify the Shading parameters of the floor material. 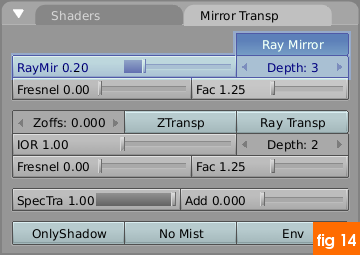 Press [F5] and got to ‘Mirror Transp’ Tab next to Shaders and press ‘Ray mirror’ and increase the ‘RayMir’ slider to .20. And finally Depth 3 (under Ray Mirror button), thats all is needed for the wooden floor material. Step-15 Following the procedure in step-11 add a material for the vase. Then add three image textures namely vase-tex.jpg, vase-tex-spec.jpg and vase-deco.jpg in three different channels. 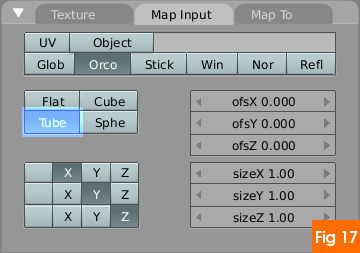 You can rename the texture channels by entering text in the Add new box which by default will show Tex(#). Rename all of them suitably. Step-16 We had added three image textures for vase and now we will modify the shading property of the vase material. Press [F5], in ‘Shaders’ tab change ‘Ref’ (diffusion property) to .400, next change Spec (specularity) to 1.700 and Hard to 400 also Depth=3. ‘Lambert’ and ‘CookTorr’ are the algorithms user to calculate the diffusion and specular property of the textures. Step-17 Now we need to give proper mapping values to the three texture channels. In the Texture tab(far right) you can see the three texture channels being visible. The ‘Map-input’ and ‘Map to’ tab will change the value of only the channel which is currently pressed(vase-tex). So to modify the properties of other channel you have to first select them. Go to ‘Map input’ Tab select Tube mapping for all three channels. Step-18 In Tab ‘Map to’ the first texture channel need not be changed. For sec channel disable ‘Col’ and enable ‘Spec’ and ‘Emit’ buttons. Also change the Var slider to .500. 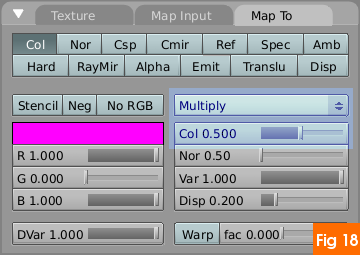 Step-19 For the third and the last channel change the texture blending mode to ‘Multiply’ from the default ‘Mix’ and ‘Col’ value to .500. Try out the render now to see the materials you applied. Also save your work now.